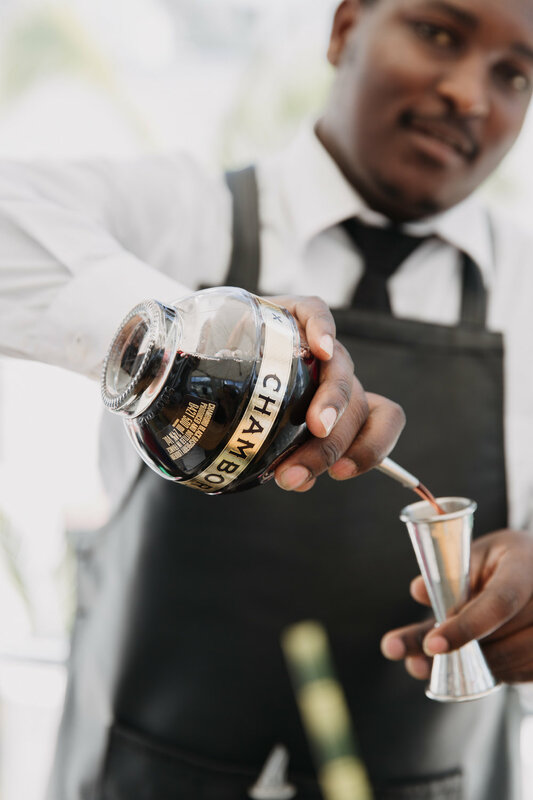 On Wednesday, 20 November 2018 Chambord® hosted an exclusive pamper party for celebs, A-listers and media at The Bay in Camps Bay. And why? Well, #BECAUSENOREASON. The guests were welcomed with the eye-catching Chambord® Royale served in a champagne flute. To highlight the delights of this premium black raspberry liqueur Chambord® also served the guests the Chambord® Margarita Coolers with Herradura, Chambord, lemonade and lime and a Chambord® Lemonade with Finlandia – ideal cocktails for the summer. Private Beach Club’s VIP lounge and pool deck was the perfect spot to compliment the refreshing summer appeal of this all-natrual rasperry liqueur. While the berry bliss of Chambord® inspired fruit and flowers galore, pampering for the day included nail and hair care pop-ups, make up specialists, beauty products and cool swimwear collections. Pop-ups included On Trend, MaxiB Collection, Kokodakota, Beach Cult, Vilebrequin and Nvme Bikini, with activations by MUD make-up, Bianca Moore (hair) and Fox Box (nails & eyebrow threading). Healing Earth and Chambord® provided beautiful gift bags. DJ Anthea Scholtz provided beachy tropical house beats. Known for her broody techno, Anthea lightened the day with accessible vocal-driven mixes. Salt and Pepper Catering’s canapés were rounded off with macaroons, a Chambord® dessert infusion and sorbet cones to cool off an exclusive, sun-kissed summer’s day. Sponsors for the Chambord® Royale day were Happy Culture, San Pellegrino, Acqua Panna and One Juice. Chambord® is a versatile, all natural, black raspberry liqueur with French royal provenance that can be enjoyed in a number of delicious cocktails. An infusion of the world’s finest raspberries and blackberries, blended with the exotic flavours of black currant, Madagascan vanilla and aged XO cognac, the drink was inspired by raspberry liqueur made in the Loire Valley in the late 1600s - said to have been introduced to Louis XIV during one of his visits to the Château de Chambord. FLAMINGLE HOW YOU CHOOSE BUT PLEASE DRINK RESPONSIBLY. NOT FOR SALE TO PERSONS UNDER THE AGE OF 18. Stay up to date with the latest news by joining our mailing list. ALL RIGHTS RESERVED. RED CARPET CONCEPTS.